Source: UNFPA. 2012. Managing Gender-based Violence Programmes in Emergencies: E-learning Companion Guide, pg. 83. Violence against women and girls can have long-lasting psychological and social effects. Psychological and mental health problems for a survivor can include: non-pathological distress (such as fear, sadness, anger, self-blame, shame, sadness or guilt), depression, anxiety disorders (including posttraumatic stress disorder), eating disorders, psychotic disorders and alcohol and other substance use disorders, as well as suicidal ideation and self-harm (excerpted/adapted from UNFPA, 2012; WHO, 2012). Social consequences for survivors can include stigma, social exclusion, discrimination, rejection by family and community--all of which can lead to further poverty (WHO, 2012). While some survivors may be able to recover through personal coping mechanisms, many survivors may require additional support. Psychosocial support can benefit survivors by facilitating recovery and allowing survivors to resume social functioning (UNFPA, 2012). Healing at an individual, family, and community levels by rebuilding trust and coping mechanisms. Empowerment by realistically and safely working to increase women’s role in decision-making and their access to economic opportunities. Acceptance by ensuring survivors and their children are included and supported by their communities (excerpted from IRC, 2012). 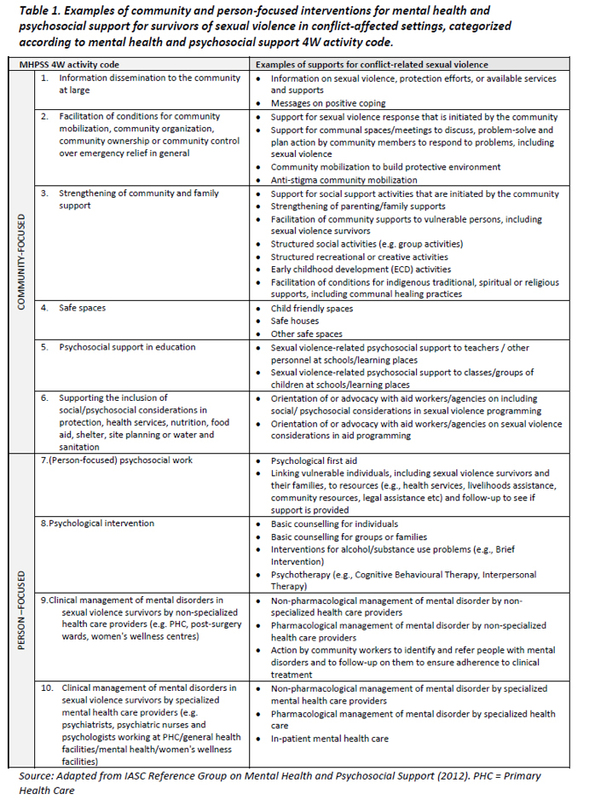 The following framework illustrates some of the key interventions that should be considered.